When Jiang Wan is targeted by at tool card played by another player, he can choose to draw a card and have it not affect him. Then Jiang Wan is attacked by the source. Once per turn, Jiang Wan can place a non-delay tool card on his character card. This card is known as a Compliance. When Jiang Wan replaces the Compliance card, he recovers one health. Once per turn, Jiang Wan can use any two cards of the same color as the Compliance on his character card. 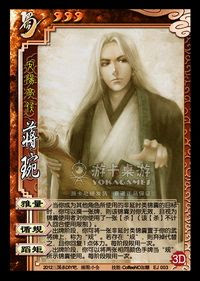 At the end of his turn, Jiang Wan's compliance card remains on his character card. This can be replaced on a future turn. Jiang Wan can only put a card down one time each turn. He can also only use "Rule Change" once per turn. This can be before or after he uses "Compliance".